"I am impressed with the professional excellence he brings to a wonderful office"
"Everyone in the office was warm, friendly and sincere - I was even seen on time." "I highly recommend them, for you will be satisfied & happy with your overall experience." "Everyone is just so nice, accommodating & kind." 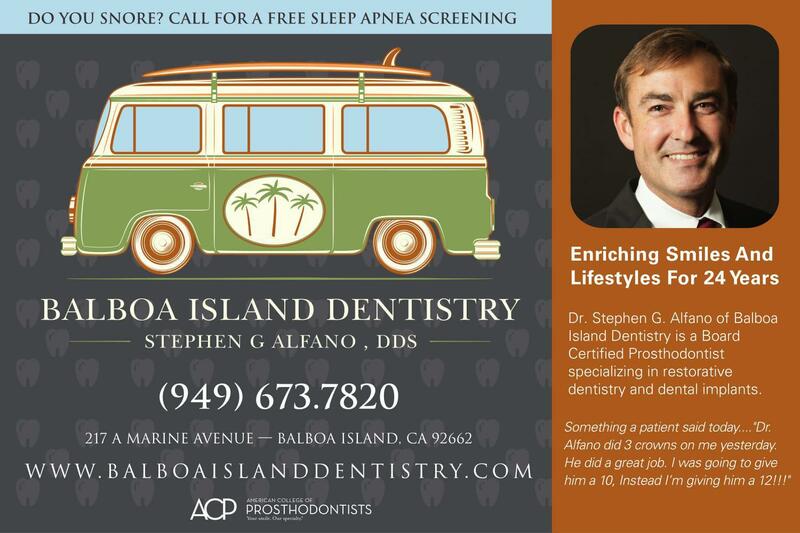 Balboa Island Dentistry is a comprehensive prosthodontic dental practice serving Newport Beach, California, and the nearby region. The dedicated staff works together to provide patients with regular dental hygiene checkups and standard treatments including fillings, root canals, and periodontal treatment. In addition, the team offers specialized cosmetic dental services, including veneers, teeth whitening, and dental implants. Dr. Stephen Alfano leads the team and ensures each patient receives the care they need and deserve. He's been practicing as a dentist for 24 years after earning his degree from the University of Texas Dental School in San Antonio. He possesses board certification from the American Board of Prosthodontics. He has a long list of active memberships in reputable dental associations such as the American College of Prosthodontists, the American Academy of Maxillofacial Prosthetics, the Academy of Osseointegration, the American Dental Association, and the California Dental Association. Dr. Alfano treats a wide range of dental issues, including sleep apnea and temporomandibular joint syndrome (TMJ). He prescribes and customizes oral appliances as well as educates and improves patient's smiles using whitening procedures and veneers. Because he realizes the stress some feel when going to the dentist, he offers conscious sedation to relax the patient and possesses the necessary certification to administer this comfort measure. Dr. Alfano has published several articles and recently authored a textbook chapter describing the immediate loading of dental implants. Dental implants are the healthiest tooth-replacement option available. Find out why over 500,000 Americans choose to restore their smiles with them each year. Is Your Snoring Sleep Apnea? While we typically use snoring and sleep apnea synonymously, they're separate conditions. Explore this post to see what differentiates them. Why Visit a Prosthodontist for Dental Care? Prosthodontists specialize in restorative and cosmetic dentistry. Find out why we recommend visiting a professional like Dr. Alfano for high-quality dental care. Struggling with your dentures? Watch this video! Connie has extensive knowledge and training in the dental field. She joined our team in April of 2015.She has brought a strong work ethic and organizational skills to our office. She is the mother of 4 and expecting her 9th grandchild this spring. If she is not hanging out with her family, you can find her on the weekends watching and dancing to local tribute bands. Also, she enjoys doing crafts and repurposing furniture. Shellie has been with Balboa Island Dentistry for over 37 years. She was an “island gal” from the time she was a year old and graduated from Corona del Mar High School. Shellie attended Andrew’s University in Michigan and also Loma Linda University in So Cal. Shellie enjoys traveling the world, fine wine, and cuisine and spending time with her husband Scott and their 2 Chihuahuas. We have such wonderful patients and it is truly rewarding helping and being there for our patients. Cathy loves working on Balboa Island in such a beautiful and caring office. Between the wonderful patients and dental team, it really feels like family. Cathy has worked in the dental field for over 38 years and has been with Balboa Island Dentistry for over 27 years. She loves working with all of the different patients and takes a lot of pride in making sure all of their dental needs are well taken care of. Cathy’s son who is now 23 (can you believe it?) is still her pride and joy. Cathy loves her trips to Montana, weekend getaways, music, movies, and crafting. She moved to Orange County from Loma Linda 8 years ago to enjoy the cooler weather and beach life. Some of Angie's interest in her off time include traveling abroad, trips to Mammoth for hiking, biking, and skiing, trying new restaurants, and family time. As a Dental Hygienist, I want to promote optimal dental care and provide proper education. My goal is to make each patient feel comfortable and satisfied by the services they received by being gentle yet thorough. Karen joined the Balboa Island Dentistry team in July 2017. Hailing from Boston, Massachusetts, Karen has over 30 years of family dentistry experience as a Registered Dental Hygienist. Karen has joined the practice as our new Sleep Study Coordinator with a focus on sleep apnea, a serious disease which has a direct impact on health and longevity. I truly love getting to know my patients, to me it's the best part of my job. Developing a genuine comfort level allows me the opportunity to truly help with their dental care needs. In Karen's free time she enjoys hiking, Zumba, family and is a HUGE New England sports fan.